Ping-Pong, also known as table tennis, has been a game that both children and adults have enjoyed for over 100 years. While the game is so simple, it is hard not to have fun playing it. When thinking of a theme for a board game, Ping-Pong is not something that immediately comes to mind. Nonetheless there have actually been several different board games based on the sport. 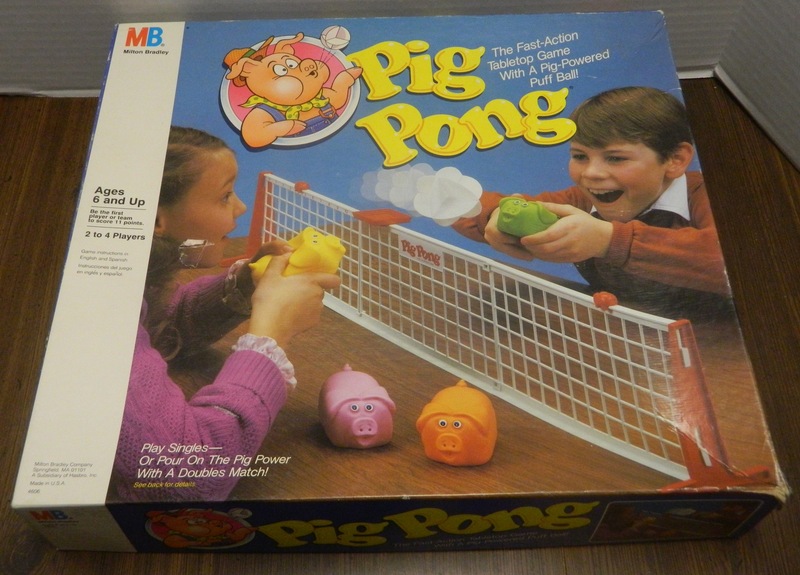 Most of these games recreate the mechanics of Ping-Pong with a few small tweaks like Pig Pong. Today’s game, Pingo Pongo, tries to turn Ping-Pong into a simple card game for children. I can’t say that I had high expectations for the game as I didn’t really think that Ping-Pong would translate well to a card game. Pingo Pongo might be a decent quick distraction for young children, but it is a mindless card game with no real meaningful decisions. Deal five cards to each player. The rest of the cards are placed face down on the table to form the draw pile. The player to the left of the dealer will start the game. The first player will either play a Pingo or Pongo card face up on the table. This player has played a Pingo card. The next player can either play a Pongo or a Pingo Pongo card. The next player will have to either play the opposite card (Pingo on Pongo or Pongo on Pingo) or a Pingo Pongo card on top of the previously played card. Players have been alternating between placing Pingo and Pongo cards. If a player does not have a card they can legally play or has no cards at all, they will lose their turn. If none of the players can play a card, each player draws cards from the draw pile until they have five cards in their hand. Play then continues like normal. When a player plays a Pingo Pongo card, the players will alternate playing Pingo Pongo cards. The last player to play a Pingo Pongo card gets to take all of the cards that have been played since the last Pingo Pongo card. 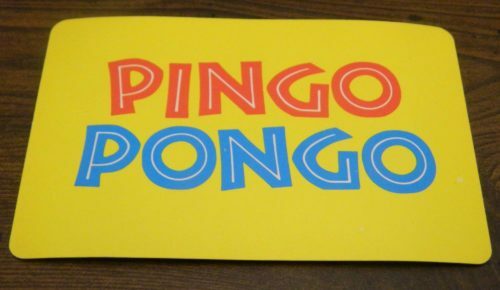 A player has played a Pingo Pongo card. The players alternate playing Pingo Pongo cards. The last player to play a Pingo Pongo card will take all of the cards on the table. The players will then draw cards from the draw pile until they have five cards in their hand. The game ends when either all of the cards have been taken or all nine Pingo Pongo cards have been played. The players count up all of the cards they collected. The player who collected the most cards wins the game. Just like the game itself, I have to admit that there isn’t much to talk about when it comes to Pingo Pongo. So I will be blunt, Pingo Pongo is not a good game. As Pingo Pongo was designed for children, I never expected it to be a great game. With this in mind though, I will address how the game will work as a children’s game later. Based solely on the gameplay, Pingo Pongo is a flawed and generally boring game. Unless you are playing the game with younger children, I can’t really see adults getting much out of the game. In theory I think it is possible to make an interesting Ping-Pong card game. It would require different types of shot cards with each type of shot only being able to be returned by specific cards. This could have lead to some strategy as you choose which shots to use and tried to figure out what cards the other player had. Unfortunately Pingo Pongo has none of this. There are only three different cards in the entire game. 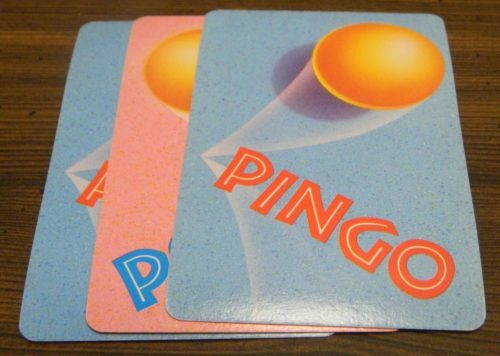 For most of the game players will just alternate playing Pingo and Pongo cards. There is no strategy to this decision as you have no choice over which card you play. The only thing that ever changes up the gameplay is when a Pingo Pongo card gets played. Then instead of alternating between Pingo and Pongo cards, players take turns playing Pingo Pongo cards until no one has any remaining. The last player to play a Pingo Pongo card gets to take all of the cards that were played. Then the players go right back to alternating between playing Pingo and Pongo cards again. What ruins Pingo Pongo is the fact that there are very few decisions in the entire game. Outside occasionally being able to play a Pingo Pongo card, you make no decisions in the entire game. If you have the opposite card in your hand you play it. If you don’t, you lose your turn. When you think about it there really isn’t even much decision making when it comes to the Pingo Pongo cards either. Unless you know the other player(s) will be able to play a Pingo Pongo card after you play your last one, you might as well play a Pingo Pongo card as late as possible since you then have the opportunity to win more cards. 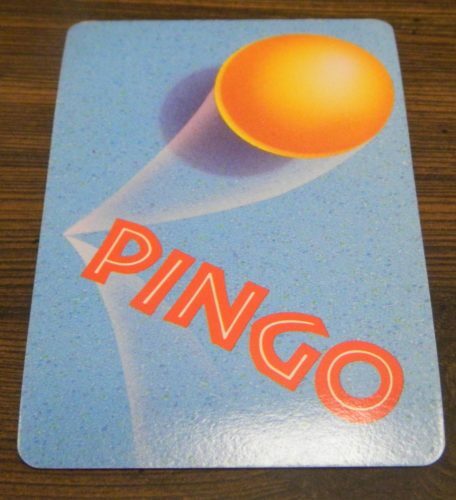 After playing a Pingo Pongo card, all of the other players have to play a Pingo Pongo card if they have one. With there being next to no decision making in the entire game, there is no real strategy in Pingo Pongo. A player will either win or lose the game based on what cards they are dealt. Whoever is dealt the most Pingo Pongo cards is basically guaranteed to win the game. As a matter of fact the Pingo and Pongo cards are basically pointless. It doesn’t really matter if you aren’t able to continue a rally as all you do is lose your turn. Losing your turn doesn’t really hurt you in the game. All the Pingo and Pongo cards do is count for points once someone wins the Pingo Pongo “battle”. Whoever wins the most or the most valuable Pingo Pongo battles will win the game. This means that over half to two thirds of the game is basically pointless. While this comparison is not perfect, I would compare Pingo Pongo to the card game War. For those of you who have never played War, two players flip over cards and whomever has the higher card takes the other player’s card. Players have no choice over which card they play so they just have to hope that luck is on their side. Pingo Pongo’s gameplay is different in that you get to somewhat choose which card you play but it still has the same feeling of mindlessly playing cards. It is one of those games that may give you a little mindless distraction but it gets dull rather quickly. This may be an issue for adults but I think it could be a positive for younger children. The game has a recommended age of 5+ and I think that is appropriate as there isn’t much to the game. 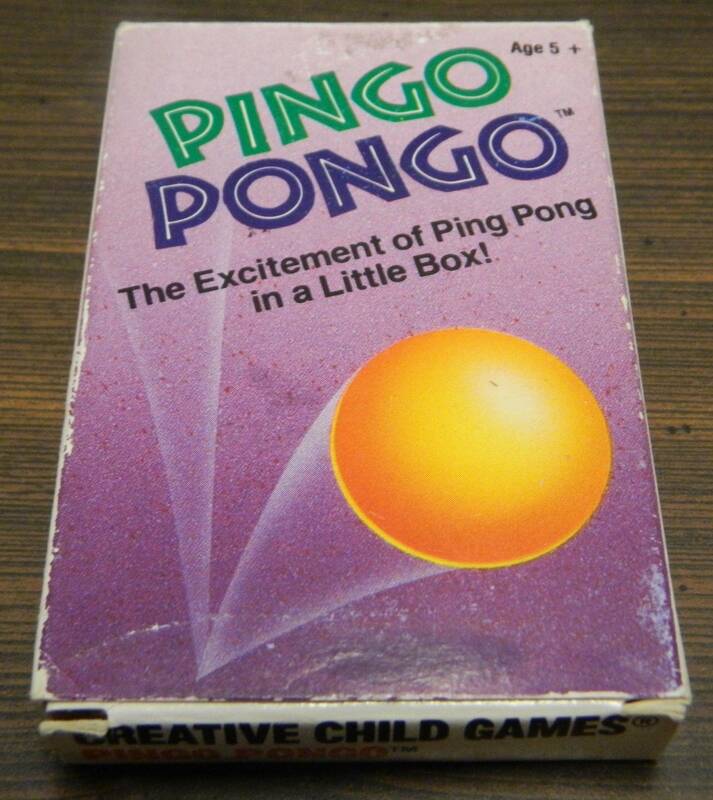 Just as kids enjoy War, I can see kids having fun with Pingo Pongo. 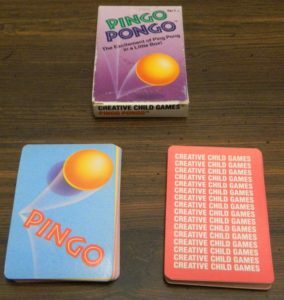 While playing the Pingo and Pongo cards are pretty meaningless, I think most young children will enjoy the back and forth gameplay. On top of that the game plays really quickly. I would say most games can be finished in two or three minutes. This is a positive even for adults as if you don’t like the game, it ends quickly. Pingo Pongo deserves all of the criticism that I gave it but I kind of feel bad about it as Pingo Pongo was clearly designed to be a very cheap game. I am guessing the game originally only sold for a couple dollars. For an impulse buy, it is not surprising that little effort was put into the game. Why put a lot of time into designing and play testing a game that you are only going to sell for a couple dollars. This also applies to the components which are far from special. You only get 35 cards. The game probably would have benefited from having a larger deck as you wouldn’t have had to constantly reshuffle the deck. The card artwork is also quite bland and the card quality could have been better. Should You Buy Pingo Pongo? Simply put Pingo Pongo is not a very good card game. Basically players take turns playing the opposite card of the previous player. As there are only three different types of cards, there are basically no decisions in the entire game. The only decisions come from choosing when to play the Pingo Pongo cards which is pretty obvious as well. As there are very few decisions in the game, there is next to no strategy. Whoever is dealt the most Pingo Pongo cards is basically guaranteed to win the game. This leads to a pretty boring game for adults. With how simple and quick the game is though, I could see young children enjoying Pingo Pongo. If you don’t have any young children, I don’t really see you getting much out of Pingo Pongo. If you have young children and you think they will enjoy the game’s concept, it may be worth picking up Pingo Pongo. I would only purchase the game though if you can find it for really cheap. Simple enough to be enjoyed by young children. Games only take a couple minutes. Has very little decision making leading to almost no strategy. Relies almost exclusively on luck as whoever gets the most Pingo Pongo cards is likely to win the game.